FlexNow Joint Action Formula is a unique formula for promoting the normal joint function. Unlike other products that are based on various ingredients, each one with its clear effect on making your joints healthier, this product is based just on one ingredient, called SheaFlex70TM. The manufacturer cites clinical studies that show this compound as being the most effective in reducing inflammation while being based on a natural extract. Since the product does not contain glucosamine and chondroitin, you may need to supplement your dosage with products that contain these key ingredients. Here is more info on FlexNow Joint Action Formula that you may find useful. What Does FlexNow Joint Action Formula Contain? This particular ingredient is obtained from shea nuts, the same from which shea butter, used in beauty creams that are very popular right now. However, while shea butter contains only very little shea triterpenes, an active ingredient with proven results in reducing inflammation, the compound found in FlexNow Joint Action Formula has a 70% concentration of this ingredient. The manufacturer offers info on the ingredient and how it works, as well as references to clinical studies. The selling point is that this supplement can treat joint problems resulted from the loss of collagen, but this also means that you must also take products that contain glucosamine and chondroitin. The recommended dosage for this joint health supplement is three soft gels taken daily, all together or spread throughout the day. The manufacturer recommends taking all three pills with breakfast for best results. The manufacturer offers two bottles with 90 capsules for 43.95USD, which is a good price, seeing that you are purchasing two month supply. A lot of information is offered on the manufacturer’s website, but we saw no reference to any guarantee. This means that you may have to deal with resellers in case you ask for a refund. FlexNow Joint Action Formula is an original product, since it does not contain the same well tested and tried ingredients for joint health, like chondroitin and glucosamine. Also, it clearly states that it addresses problems that are not usually addressed by the aforementioned ingredients; this means that you may have to take more supplements to get the same results, since the active compound in FlexNow Joint Action Formula is focused mainly on reducing inflammation. 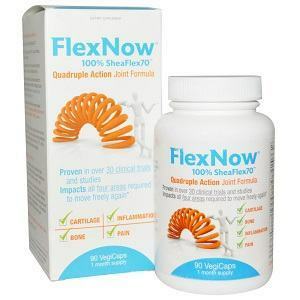 Mark Stevens	reviewed FlexNow	on May 25th	 and gave it a rating of 2.